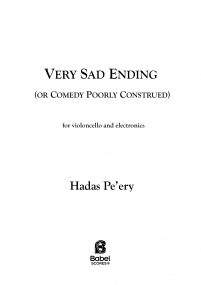 Hadas Pe'ery is a composer, sound artist, audio professional, educator and activist. Currently residing in Tel Aviv, Hadas teaches electro-acoustic composition and musicology at the University of Tel Aviv and is responsible for developing the university’s electronic music studies curriculum. She is curator of “This is what happens when you play with electricity”, a concert series for experimental electro-acoustic music that aims to introduce new audiences to electronic music and to promote women composers and performers. 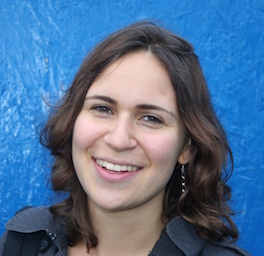 A social and political activist, Hadas is involved in numerous initiatives that advocate for Palestinian, refugee, women and worker rights, such as “the Democratic Front for Peace and Equality” and “Elifelet - Citizens for Refugee Children”. 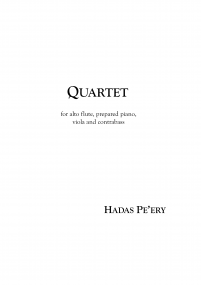 Hadas’s works are regularly commissioned and performed throughout America, Europe and Israel by institutes and ensembles such as Court-Circuit (Fr), MusikFabrik (De), Akademie der Künste Berlin (De), Meitar Ensemble (Isr), Lunatics at Large Ensemble (USA) among others, and at festivals such as Manifeste (Paris), Zeitkunst (Berlin), Sound Ways (St. Petersburg) among others. An interdisciplinary artist, she collaborates with choreographers, directors and visual artists throughout the world to create interactive, live electronic performances. A laureate of awards and grants from the Theodore Presser Foundation (NY), the Fondation International Nadia et Lili Boulanger (Paris), New Music USA (NY) and the Tel Aviv Foundation for the Arts amongst others, Hadas also received residencies from the Camargo Foundation (Fr) and Herrenhaus Edenkoben (De). She was recently awarded the prestigious Israel Prime Minster’s Prize for Composers. 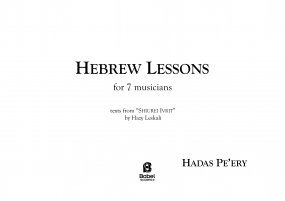 Hadas holds B.Mus degrees in composition and music theory from the Mannes College of Music in New York, an M.A. in musicology specialised in computer-aided composition from Université Paris 8 and an M.Mus. in electronic music from the Hochschule für Musik Hanns Eisler in Berlin. Her principal composition teachers have included: Wolfgang Heiniger, Jean-Luc Hervé, Philippe Leroux, Christine Groult and Robert Cuckson. Additional teachers have included: Johannes Schöllhorn, Rebecca Saunders and Chaya Czernowin.